Some Alligator Fun And A Contest Rule and Prize Update!! I have made up a poem! Anyone whose sensibilities may be injured by my attempt at poetry should leave immediately! Those of you who are brave enough to stay, prepare yourselves. You may need some cake to fortify you. Should really have a dog. I answered, “Thank you, Daddy, but on this my heart is set. Now. About that reason. The lovely and talented Catherine Johnson, author of Weirdo Zoo (buy your copy HERE), has a new book out! 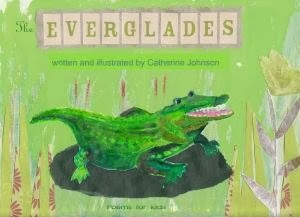 It’s called The Everglades (hence the alligator themed “poem”) and she describes it as a collection of poetry for children who are old enough not to mind the odd arm hanging out of an alligator’s mouth 🙂 Seriously. How can you resist that? 🙂 She says, “Half the poems are serene, and half are snorty.” And she drew the illustrations herself!! Such talent!! She is celebrating on her blog HERE and running a giveaway, so scuttle on over as fast as your little alligator legs allow and join in the fun! Should you happen not to be lucky enough to win a copy, you may buy one HERE! Now, before you all go marching off to your magnificent Mondays, I’d like to clarify a couple things about the March Madness Writing Contest. 1. You do not have to include spring – that is optional. 2. The story can be a picture book or a short story – whatever you like. 3. If it’s a picture book, you may NOT include art notes, because we get into a weird area of whether that’s fair in terms of word count and added description etc. So if you write a picture book that’s wonderful, but make sure art notes aren’t necessary to understand it. Now then! I hope that fills you with inspiration and fuels the muse! Thanks so much, Susanna! What a great celebration and your poem is so cute it could go in the book. You are awesome! Anything for you, Catherine! 🙂 Good luck with your new book! How do you actually enter the contest? Full details are on the original post http://susannahill.blogspot.com/2014/02/perfect-picture-book-friday-girl-who.html but basically you just post the story on your blog between March 20 and March 24 or post it in the comments on my March 20 post or email it to me and I'll post it. My doddering confusion is the reason for Clarification #1! I am so proud. And, YOWZA, what a sweet selection of prizes! Thanks, Susanna, for kicking off our Monday with enthusiasm and your inspiring poetry! It is a great motivator during these (hopefully!) last few weeks of winter! I think there should be a tag line for Monday, like TGIF for Friday. GGM? ?– Get Going Mondays! What do you think? Have a good one…. Sweet promo for Catherine and sweet cake (although I admit I despise fondant). I have been toying with a contest draft – the question is will I get it done! Kids spring breaks are ill-timed. . .
Do it all in verse. You're a better poet than you think you are! OMG, I cannot get past that alligator cake!! If you were saying anything else, I couldn't hear it…LOL! As for your writing contest, my mind is a complete blank! That's wonderful if I'm meditating and trying to achieve a Zen state…it's not so wonderful if I'm trying to enter a contest or be productive. Catherine's poetry is so kid friendly – I love it, and the cake! Mmm, contest, why yes, between essay on The Death of Poetry and writing a Middle School Writing curriculum… can it be done? Congratulations Catherine. Will look forward to its release. Sounds like a fun book for kids. Love that cake! I feel silly asking this but would “fairy tales” also include fables like tortoise and the hare? When I googled fairy tales it did include fables but just want to be clear. Thanks for this fun opportunity! *snort*Love your Catherine post. Your poem borders on CREATIVE GENIUS. YES. I said it. CREATIVE GENIUS (with an exclamation point.Two of them)!! I would enter, but I'm just not very fairytaleish. Plus, Ivy is preparing for SAT in October. And I'm revising my MG, which I thought was really a YA, but now realize it's a MG, thanks to my lovely pal Theresa. I have so much going on (and I know you can feel my pain) that I might EXPLODE! Ahhh, that felt a little better. You always make me smile, Robyn! Thanks, Pat! It is already out. I can't wait to see what you do for that illustrator contest Teresa. Your poem is adorable! I am looking forward to your contest! I already have a Picture Book manuscript from a while back ready to go! I like your poem. It's a perfect boy poem. I have an idea for the contest. Now all I need is time! You are totally NUTS, Rob 🙂 MWAH! As for the contest, you are full of excuses and I will not accept them at all. I shall await your entry! The wikipedia defn. I googled says: A fairy tale (pronounced /ˈfeəriˌteɪl/) is a type of short story that typically features European folkloric fantasy characters, such as fairies, goblins, elves,trolls, dwarves, giants, witches, mermaids, or gnomes, and usually magic or enchantments. Fairy tales may be distinguished from other folk narratives such as legends (which generally involve belief in the veracity of the events described) and explicitly moral tales, including beast fables. I know – isn't that cake gorgeous?! 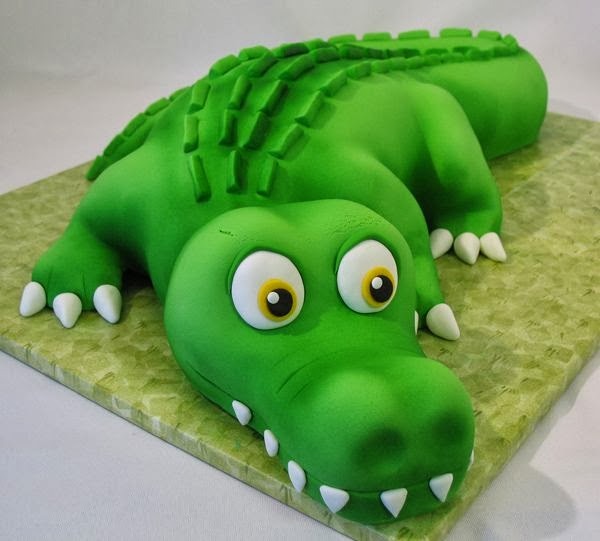 That alligator cake is amazing! And what a fun poem. You blow it off, but I thought it was very fun. My kids would love it. 🙂 And I love all your contests. What awesome prizes! I am on a strict revision schedule, but your category really, really tempts me. 🙂 Can't wait to see all the entries! Thanks for the clarification Susanna. Now I better get busy!